Every month BellaRusticaMarket donates a portion of all proceeds to the Humane Society of United States and my very own Assisi Farms, named after Saint Francis of Assisi, the patron saint of animals. Assisi Farms is a continued vision long in the making. Yesterday I attended two Lab Rescue Fairs to search for the newest member of Assisi Farms. 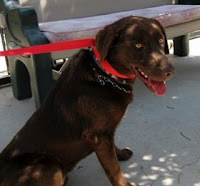 I brought Scout with me as she eventually will have the final say and we decided we would like to get to better know a three year-old male Chocolate Lab and have arranged a visit for this week . This handsome boy is being sponsored by Labradors and Friends. This darling poster (and others like it highlighting different breeds) can be purchased at the same place. "Very Sweet, Everyone loves them!" Rita Reade, la mia amica Siciliana, is running out of ideas for her lovely and truly handmade signs and needs your help. Leave her a comment with the word or phrase that you would like to see on a sign and you could be the winner. One of Rita's chickens will choose three winners upon the 100th post. Rita made these two signs for me and there are other samples several posts down here and on her blog, Mammabellarte. Bella Rita is beautiful, talented, smart, & quick witted in a way that is all the more charming given her strong accento Italiano. She corrects my blog Italian which I appreciate but I hesitate to correct her blog English because it is absolutamente adorabile. Gretchen Georges is just back from Paris again...but she is giving away un regalo di Italia -a gift from Italy.